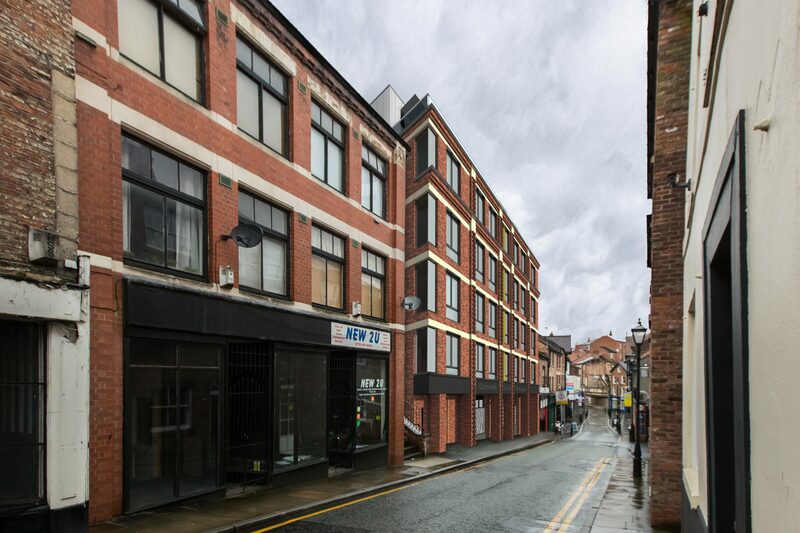 Hive Architects was asked to develop a long-standing vacant site in a key location in the heart of Stockport’s historic Underbanks / Hillgate conservation area. The aim was to deliver contemporary, cost-efficient and higher quality apartments than those currently available locally, thereby maximising value for money. The site carries many constraints, most notably the topography. Sitting against a sandstone escarpment, there is a 7m difference in levels across the site. In addition, Stockport’s busy High Street run across the back, supported by a large concrete retaining wall. Linking High Street to Lower Hillgate below are series of historic steps, known as Dumville’s Brow. Previous proposals had been approved, but the developer wanted a new scheme. To make the project viable, it wanted to improve the quality of the development and add more accommodation. 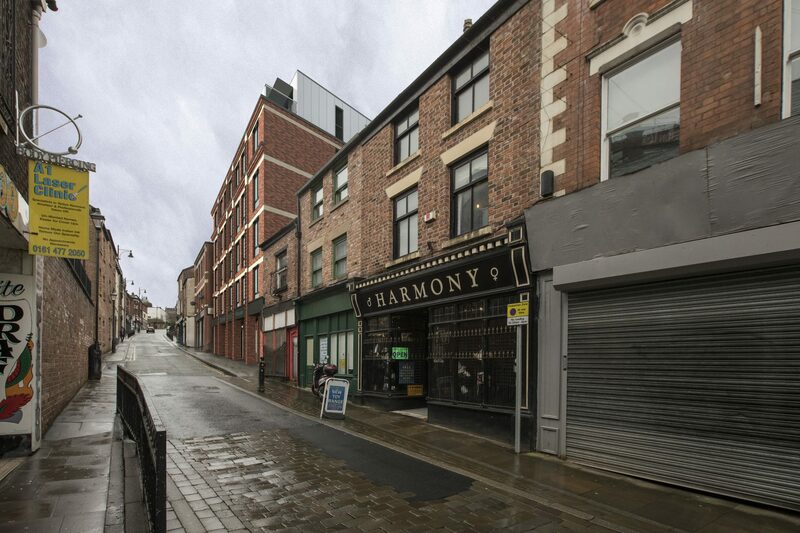 Extensive, detailed negotiations were required with the local planning authority, conservation and regeneration teams and others, to develop a scheme that would be viable, while also preserving and enhancing the conservation area. We took the unusual topography as an opportunity. Our design is effectively two, three-storey buildings stacked. A bridge link to High Street mid-way up the building means residents do not have more than three storeys to travel. Internally, an open plan layout maximises the usable space and provides more contemporary accommodation not common to the locality. Although some accommodation unavoidably looks out onto a retaining wall, this is softened by a new green wall addition, which will also provide for improved biodiversity in this urban location. Conservation requirements mean that seen from Lower Hillgate, the building looks like a converted warehouse. But the appearance from the other side is more contemporary. Materials are in keeping with the historic area but used in more contemporary manner, with details such as ‘burglar bond’ brickwork complemented with zinc cladding to the top floor, and small areas of colourful cladding panels. Sandwiched between a major shopping street and one of the main egress routes from the town centre, the site is certainly no easy build. Robinson’s historic Unicorn brewery and the yard gates opposite require constant access. For this and other reasons, the proposal was developed with off-site fabrication and JIT delivery in mind. The intention is to exceed regulations and the design includes rainwater harvesting. 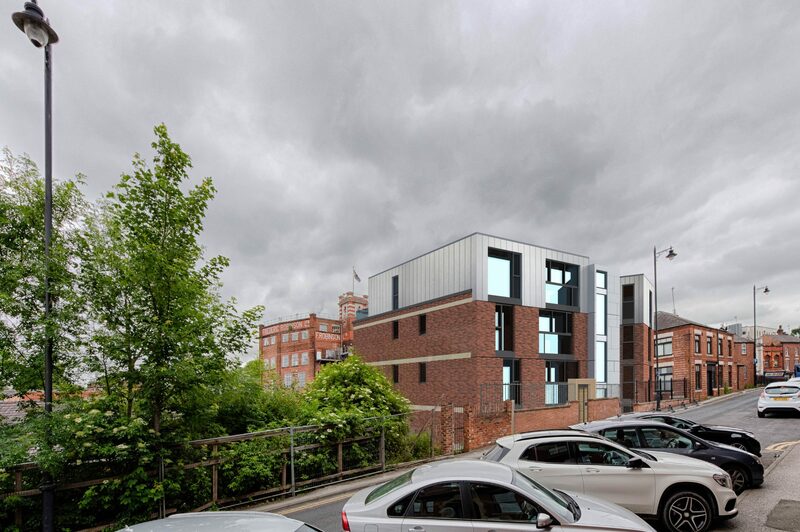 Despite its prominent town centre location and the scale of building in a conservation area, our proposals received no objections and unanimous support from the local planning authority, conservation and regeneration officers. The additional scale of our plans increased the number of apartments and we increased floor areas to meet national space standards. We altered the original plans for an external staircase with deck access to internal stairs and a lobby, adding quality over the old scheme. This, combined with the contemporary, open-plan layout, is expected to significantly increase apartment values and developer yield.